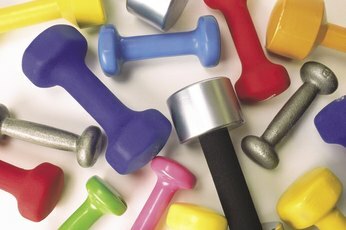 Balls, weights and resistance bands can be used in circuit training. Circuit training routines offer both cardio fitness and strength-training exercises in a timed sequence. A typical circuit consists of between eight and 15 exercise stations repeated two to three times with a cardio exercise in between for a total of about 40 to 45 minutes. With simple exercises, you can arrange a circuit geared toward your fitness goals at your skill level and complete a full body workout in less than an hour. When arranging your stations, consider using equipment such as resistance bands, weights and balls. The diversity keeps your workout a challenge. Having a partner do the routine with you can make it fun. Start any circuit-training routine with a series of cardio exercises to begin increasing your heart rate and loosening your muscles. You can do exercises such as jumping rope, jumping jacks, burpees with a jump up or running in place. You will want the warm-up to last about eight to 10 minutes. Then you are ready to begin your circuit stations. A complete circuit should work the entire body, but if you want to concentrate on a specific part of your body, include more stations that work that particular area. For example, a golfer would want to include more back- and shoulder-strengthening stations. Choose each exercise that will isolate or work a particular muscle group for your goal. Examples of exercises can include military press using hand weights in one station to work your upper back, followed by biceps curls using resistance bands and then triceps extensions still using resistance bands. For the lower body, exercises can include crunches using a weighted ball for your abs, hamstring curls with a stability ball and then reverse lunges. Combine both lower body and upper body by doing mountain climbers followed by squats holding hand weights. Arrange the eight to 15 stations so that you rotate to each one every minute. All exercises should be done with proper form and breathing rhythmically. Work through the stations until you have completed the full circuit. Perform five minutes of cardio exercises before repeating the circuit again. You can repeat the exercises from the warm-up session or include jogging a lap or running stairs. Depending on the number of stations, you can do the circuit with cardio two to three times in about 40 to 45 minutes. Once you have completed your routine, the final eight to 10 minutes should consist of stretching all the muscle groups that were used during your training. Circuit training routines do require space for each station, and the more stations used, the more space needed. Consider a designated workout area in your home that gives you an open area. A specific room, yard or even the garage are good places. Going to a park is another fun option especially when the weather is nice; you can watch the sun rise as you work out. If you belong to a gym, inquire about using a studio there, and you will have a wide variety of equipment available for your exercise stations. Based in Texas, Juliette Sweda is a certified fitness instructor with a Master of Liberal Arts degree from Southern Methodist University. She specializes in circuit training and coaching distance runners. Sweda leads runs for a nationwide fitness company and trains private clients from high school athletes to seniors.